Whether it’s a blue screen of death, a kernel panic, or even just a lag in Firefox, sometimes we just want to smash our computers. It’s perfectly OK to want to do so, but to actually do it takes some iron balls. 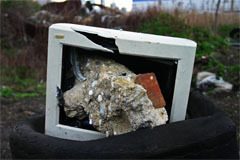 A German man in Hanover had the iron pair and actually managed to get angry enough at his PC to chuck it out a window, smashing to pieces on the ground below. When police arrived on the scene, the officer should have fined the man for creating a public disturbance. Instead, he sympathized with the man and his computer frustration, saying “Who hasn’t felt like doing that?” Very true my good man. The German man who threw the PC didn’t receive any fines, but he had to clean up the mess.